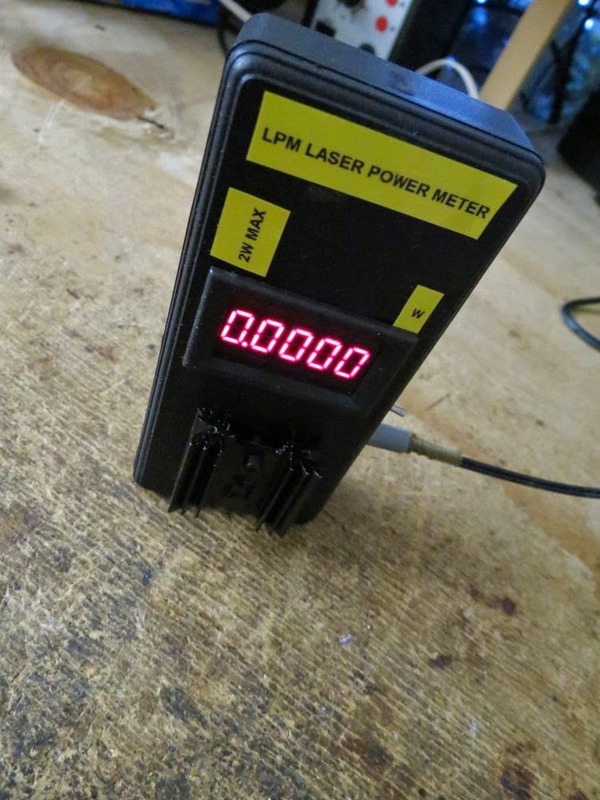 A Laser Power Meter (LPM) is an instrument that measure the energy output of laser beams. Warning! Laser diodes drive are emitting visible and invisible laser radiation and they are extremely dangerous! Their light can permanently damage the eyes. You must never look into the working diode even without the lens or point it on a reflective surface. Laser beam can cause burns or fire. This is usually a Class IIIb laser. Everything you do at your own risk. 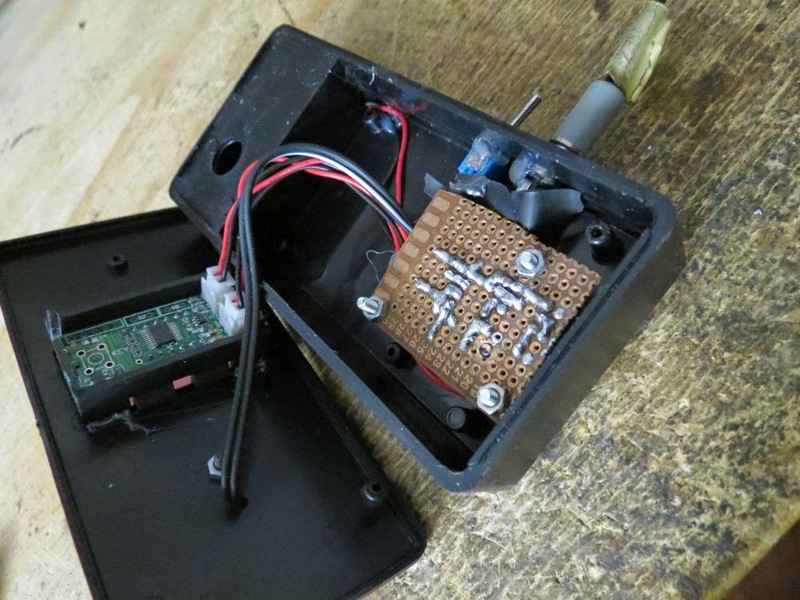 This type of meter uses a ThermoElectric Cooling module (TEC) to measure the power of a laser. The TEC will absorb the laser light, and transform the heat generated by the laser beam to an electrical signal. An operational amplifier is used then to amplify the signal and ouput it to a volt meter. Voltage meter will display the power in W unit of the laser beam you are testing. The TEC takes a little amount of time to heat, so wait until your reading became stable. This type of meter is simple and cheap to build. It can measure laser power up to 2W, with an accurancy of +-10mW. You have to use a "small" (< 20mm x 20mm) TEC, for my circuit i've used a 6.6mm x 8.3mm TEC, Laird OT18,18,F2A 0608 HWS20mm. TEC should be glued to an heat sink, and then paint with black to absorb laser beam of any frequency. In my project the selected opamp is a common LM358. 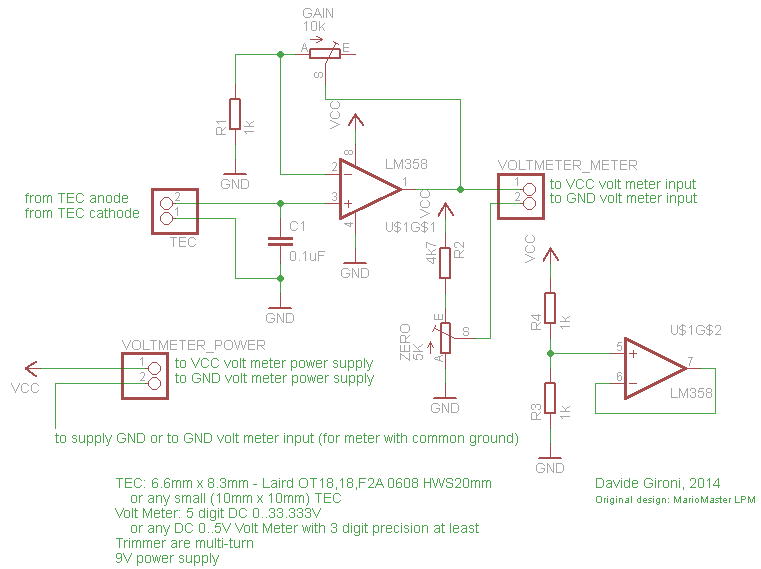 Only one channel of the opamp is used, the other is connected just to remove noise. As a voltage meter use a any DC 0..5V Volt Meter with 3 digit precision at least. As a power source, just use a 9v battery or any DC source. Trimmer are used to calibrate the meter, multiturn trimmer are preferred. Once you have build the circuit you have to calibrate it. Power on your unit, and use the ZERO trimmer to adjust the volt meter to zero. Note that this step can be skipped if you use voltage meter with auto zero calibrating mode. Heat the TEC with a laser with a know power, let's say 100mW. Wait until your reading are stable, then adjust the voltage meter output using the GAIN trimmer to fit the laser power source. I've used a 100mW red calibrated laser to calibrate this meter. Then i've tested it with a 200mW laser, and a 20mW (the one of the video) without problems. Your english is unimportant; you can communicate well, I am planning on doing this, except that the TECs that I bought really cheap are v40X40 mm, I think it will still work; my plans are to read it with an Arduino micro, and display n either a 16 char by 2 line display, or LED 7 segment readouts. My biggest problem right now s lo0cating a cheap heat sink and working out how to prevent any stray negative output reaching the Arduino analog input pin. Hello and thank you. You have to check your TECs out cause I'm not sure a 100mW laser can "heat up" a 40x40mm enough for this project to work. I take this heatsink out from some old device in the junk. Before working on the Arduino part my suggestion is to check it using a multimeter. Hope this helps. Hello, I haven't got any layout, I've use a prototype board to build this one, so I just have the schematics that you can find above. What's the wave-length you could measure with your build? Please. 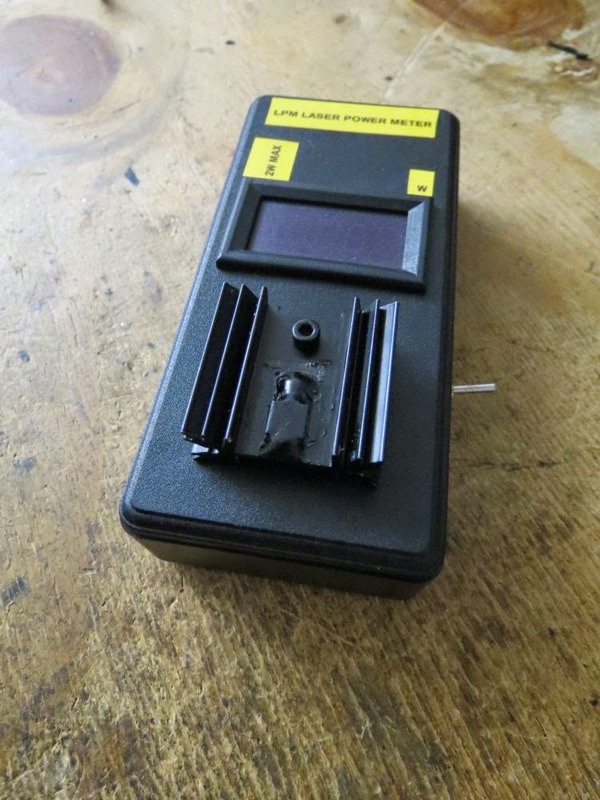 Hello, this is a thermal LPM, so it's just a matter of what you calibrate it against to. But keep in mind this is not so accurate, you get an approximation of what your beam power should be. I'm sorry, i mean, what's the wave-length of the laser pointer i can use. Could i use infrared laser? I've never try with an infrared laser, but I suppose it will work, cause the TEC sensor just react to temperature. Please can you advise on any alternatives? Hello, the important thing here is just that it will be a "small" TEC. Cause we are talking of small power laser. The one you find should do the job.